The gnu is almost completely tangled! Next we have to add a bit of color, then the shading. And I need to take some more photos! Meanwhile, I carved a gazillion stamps for the Gnus of Gnu London grand tour to take place this summer. This photo shows them partially carved and not cut apart yet. 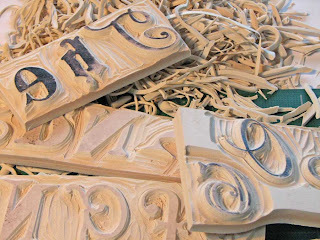 If you would like to learn to carve your own rubber stamps, I will be offering classes in my Belfry Studio. I will have the class descriptions and dates up in a few days on my Studio website and the Studio blog. I'm trying to work out dates for carving classes, Zentangle workshops and maybe a fabric (t-shirts) painting class.